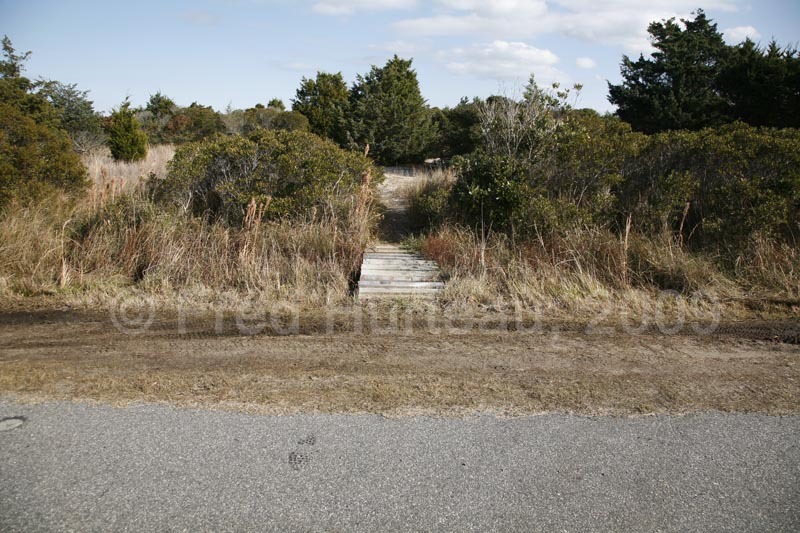 Location: 50-70 feet northeast of the Adriatic Ave. Beach Access on Atlantic Ave, in the Ocean Hill area between Currituck Beach Light and the horse fence/beach ramp, off Hwy. 12 in Corolla. ONLY VISIBLE at LOW TIDE when uncovered by sand. 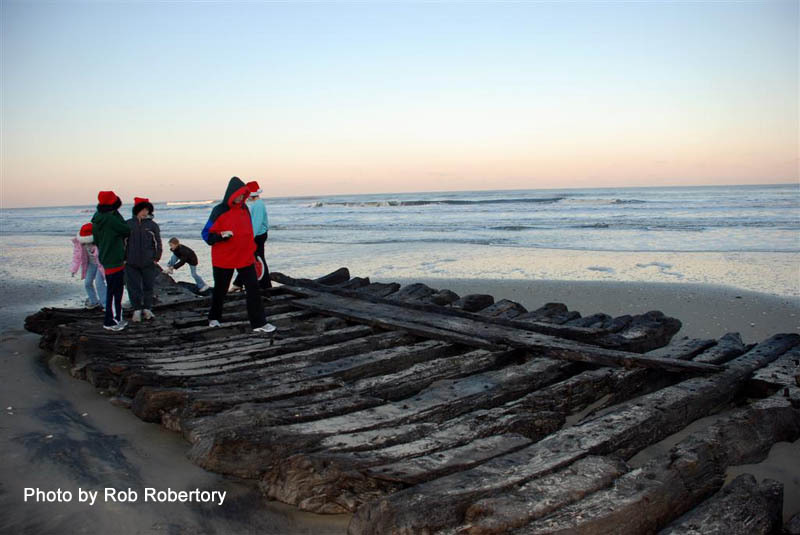 Note: This wreck is one part of a ship that washed up here in three sections in 1998. How To Find It: In Corolla, on NC Hwy. 12, go 3/10 - 4/10 mile north of the Currituck Beach Lighthouse and turn east (toward the ocean) onto Coral Lane, then left (north) onto Atlantic Ave. Follow Atlantic Ave. to the intersection with Adriatic Ave. Directly opposite Adriatic Ave. is a sandy path beach access. Walk down to the beach and turn north. 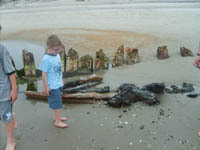 Walk 50-70 feet north of the beach access to the wreck, which may be visible at low tide. Note that there is no place for parking here, so you may need to be dropped off by car and then picked up later. Otherwise it's a long 2/3 mile walk southward from the horse fence. It can also be reached from the beach ramp at the end of Corolla Village Road exactly opposite the lighthouse. The wreck is 2/3 mile north of the beach ramp. This area may be closed to beach vehicle traffic during summer months. This much was visible on June 9 (Saturday). By June 15 (the following Friday) much of it was already covered up as seen below. This "Sightings and Location Report" with the four photos, all the information and GPS coordinates, was sent in by "the Felts clan" on June 13, 2007. The wreckage was found June 9, 2007 at 11:30 am. These folks were on vacation and discovered this wreck on the beach close to where they were staying. 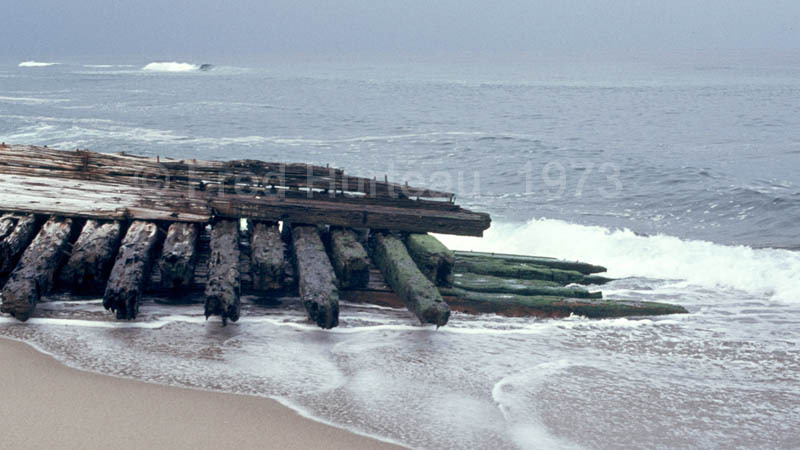 They reported "During high tide the shipwreck is entirely underwater....during low tide, planks are visible though sand covered." This is just the sort of thing that happens all the time because the beach level changes constantly, and these wrecks are uncovered and covered repeatedly. Sometimes they're visible one day and hidden from view the next. They're still there, but you wouldn't know it until the tide and currents move the sand to give you a glimpse. A new report arrived from Mike Becker of Herndon, Va., which included GPS coordinates along with new photos of this wreck site. More of the sand was washed away revealing more of the wreckage. 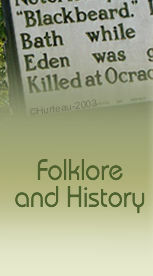 A visit to this site on December 31, 2009 provided these new photos. 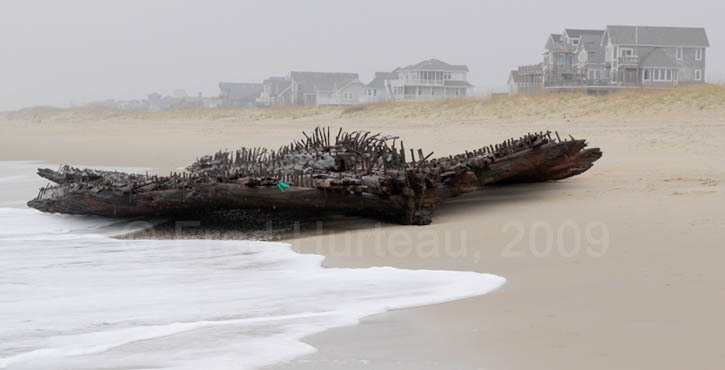 It turns out that this wreckage is only 100 feet from the reported location of a 3-section shipwreck that washed up in 1998 and is registered by the NCUAB* as ID: CKB0016. There can be little doubt it is the same wreckage. 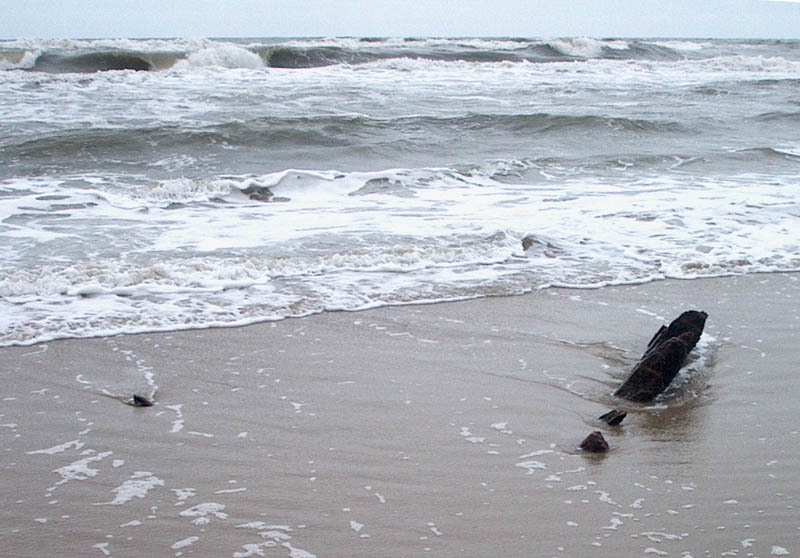 These beachgoers give a size reference for this wreckage site. 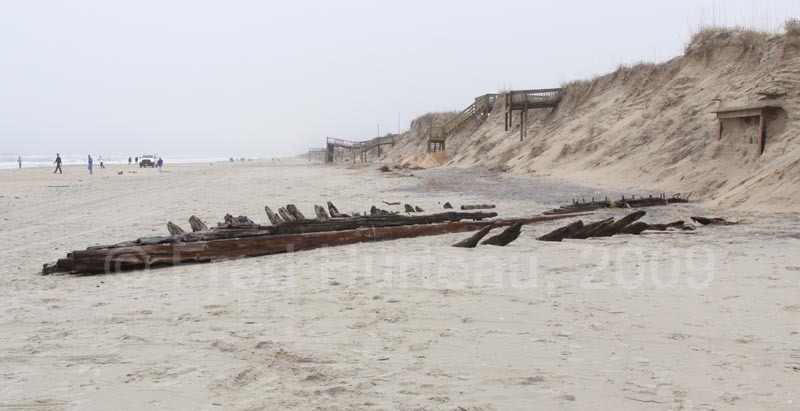 An additional eighteen inches to two feet of sand was gone revealing more of the wreckage. 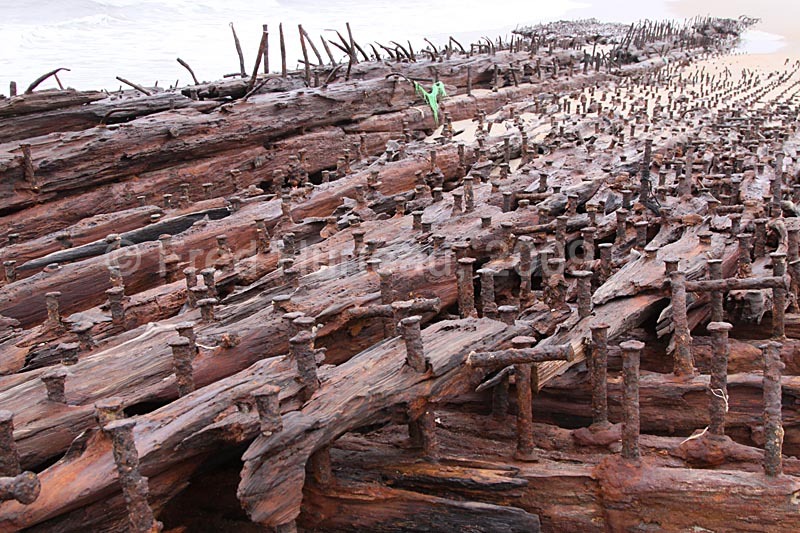 Curved planks now made the bow plainly recognizable, and the remaining section of the ship's center beam was uncovered as well. 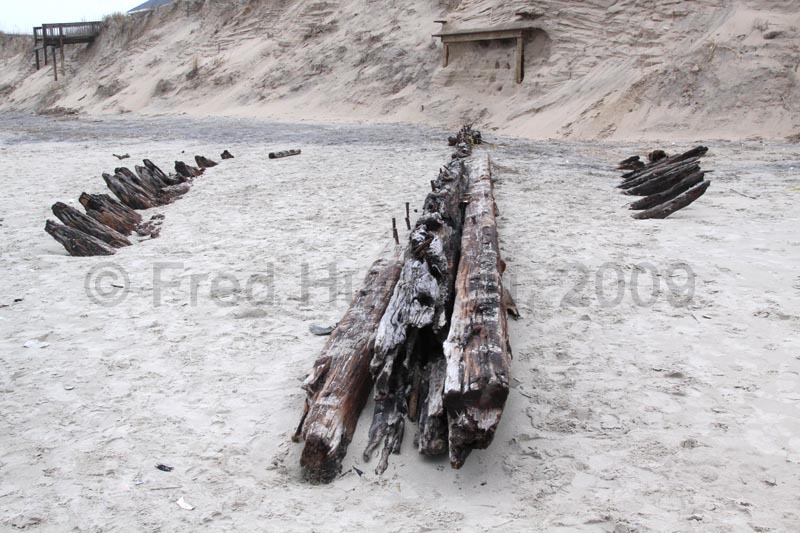 The left photos show how far out this wreckage sits from the dunes, so at high tide it would surely be covered by surf. Location: north of Shad St. beach access walkover, Corolla. How To Find It: One half mile south of Currituck Beach Lighthouse on Hwy. 12 turn east onto Shad St. and park at the parking area just past Whalehead Drive. Then walk to the beach via the access at the end of Shad St. and turn north. Wreckage is 500-800 yards north of the beach access. The kids in this photo give a good idea of the size of this heavy-ribbed wreckage. 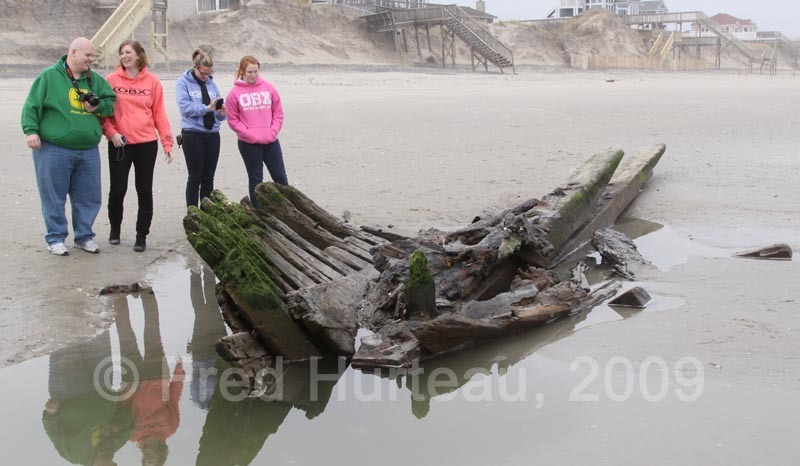 The Robertory and Murphy families noted in their report "There were two large individual beams broken off the wreck and further south (between Shad beach access and wreck)." They also reported that not long after they sent their report they noticed sand was already washing in to begin covering the wreck again. Such is the nature of these wreck sites. They appear and disappear completely at the whim of the ocean. 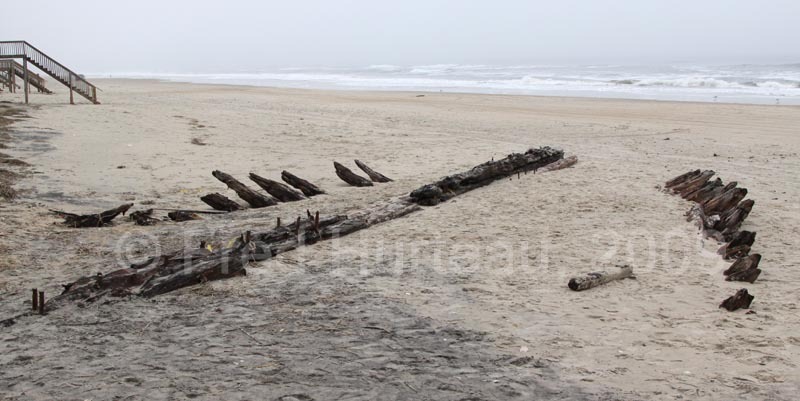 This site is still under scrutiny by the NCUAB, but preliminary information indicates this ship was approximately 20 feet wide and possibly 70-80 feet long. 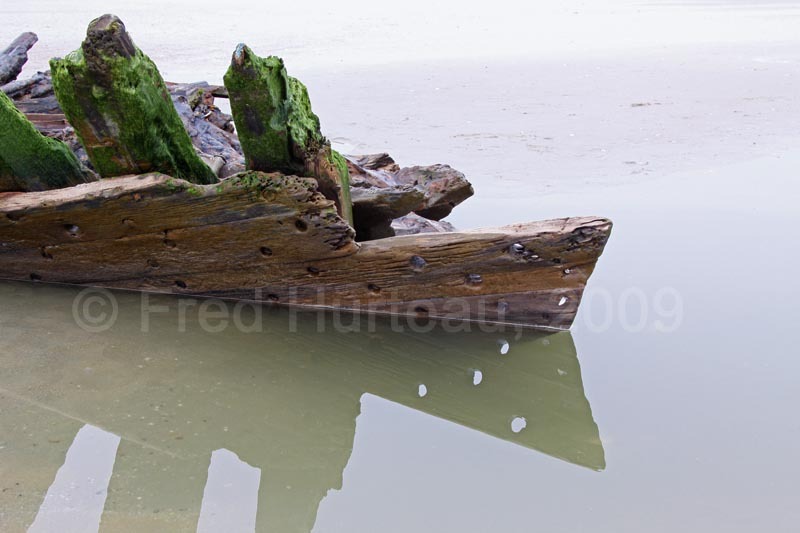 It shows indications of being English built and was likely wrecked during the American Colonial period. Location: near the beach access at the eastern end of Flambeau Rd. in Hatteras Village. How To Find It: From Hwy. NC 12 in Hatteras Village turn onto Eagle Pass Rd., then left onto Flambeau Rd. which ends at Lighthouse Rd. There is a sandy path beach access across from the end of Flambeau Rd. Follow it to the beach, then turn right (southeast) on the beach. The wreckage is about 100 feet down the beach at the surf edge. 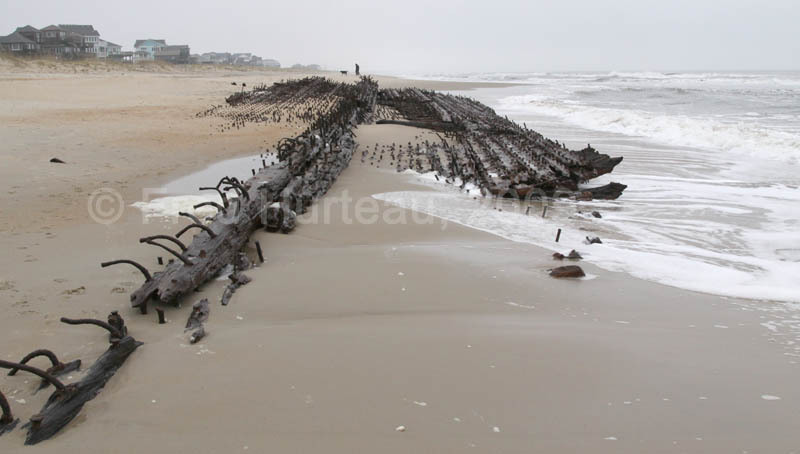 This wreckage is huge compared to all the others currently visible along the Outer Banks. It is easily 150 feet long, and literally covered with hundreds of steel spikes, giving it the look of a bristly porcupine. 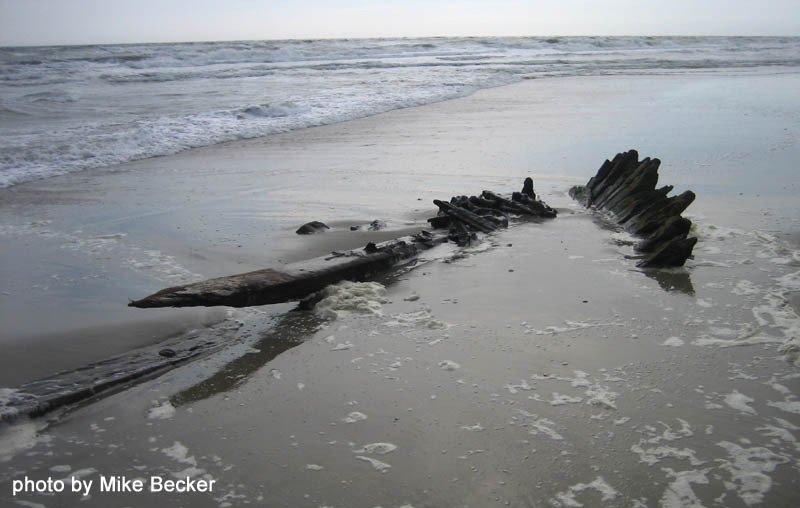 Little is known about this shipwreck, except that it was probably a cargo ship built about the turn of the 20th century (circa 1900). Looking at the wreckage in its present state it's difficult to imagine that most of the time it's nearly completely buried in the beach sand. From time to time parts of it get uncovered to varying degrees, but these photos taken in late December of 2009 show the majority of its bulk in open view. Locals know it's a very rare occasion when this much of the wreck is visible. 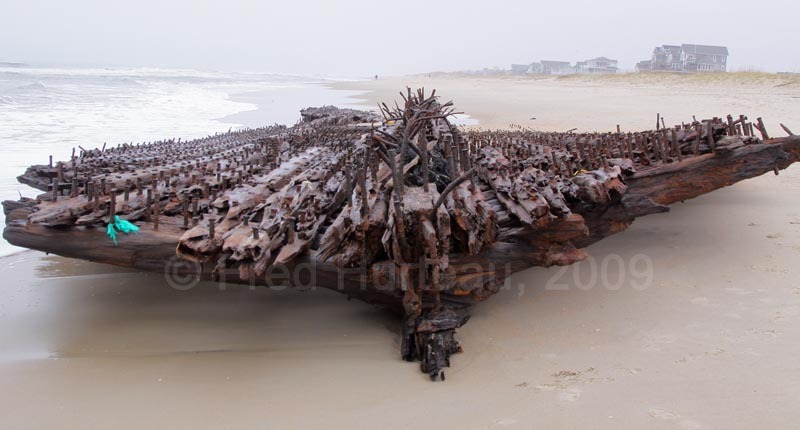 After weathering two strong nor'easters in less than a month's time during November/December of 2009, the sands of the Outer Banks have revealed several large wrecks seldom seen, and the Flambeau Road shipwreck is certainly the largest among them. Location: Approx. 1/2 mile north of the pony pens on Ocracoke. 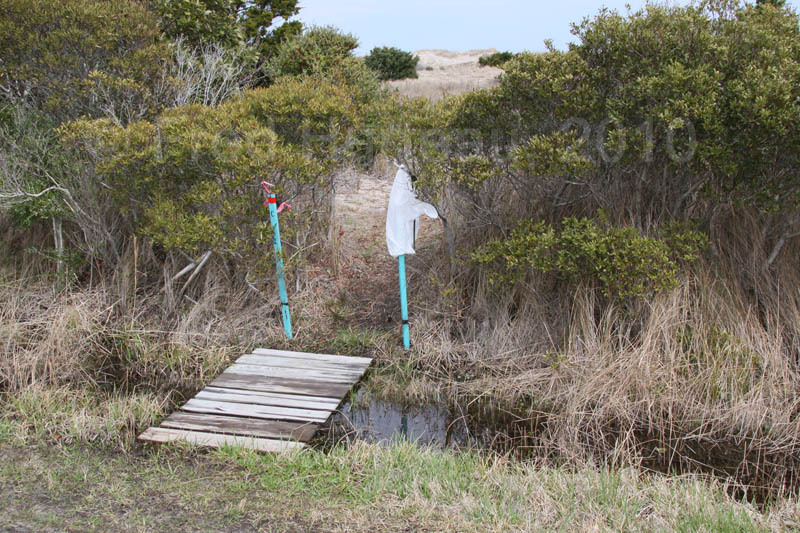 How To Find It: Go 7/10 mile north of the Ocracoke pony pens to the parking area along Hwy. 12. From the parking area walk south on the beach about 700 feet. The wreckage is high on the beach near the dunes. The person in the lower photo gives a sense of size to the wreckage. 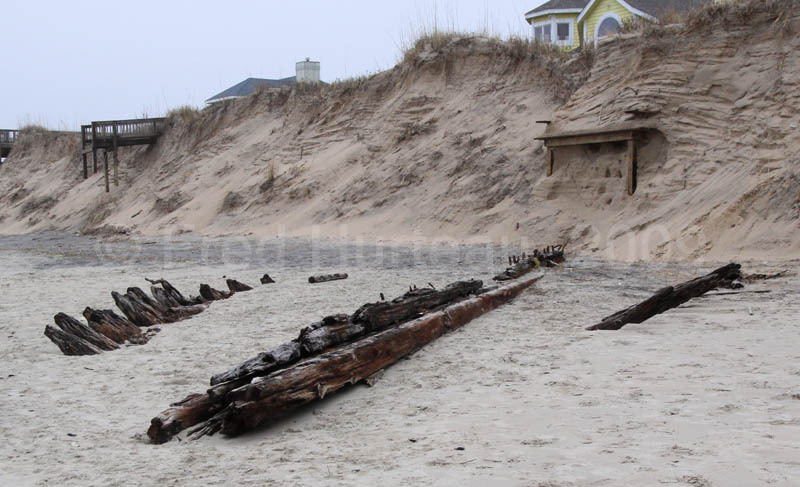 This wreckage on Ocracoke, commonly attributed to the George W. Wells, has been around for a long time. It seems to have changed little since I first photographed it over 35 years ago. The vertical photo at left was taken in December ot 2009, and the lower left photo was taken from a similar angle in 1973. Though the lower photo shows slightly more of the wreckage exposed, there seems little difference in its location or orientation to the dunes. The similarity between the two photos is quite apparent even after so many years. If more of this wreckage were visible it would be easier to realize just how large it is. 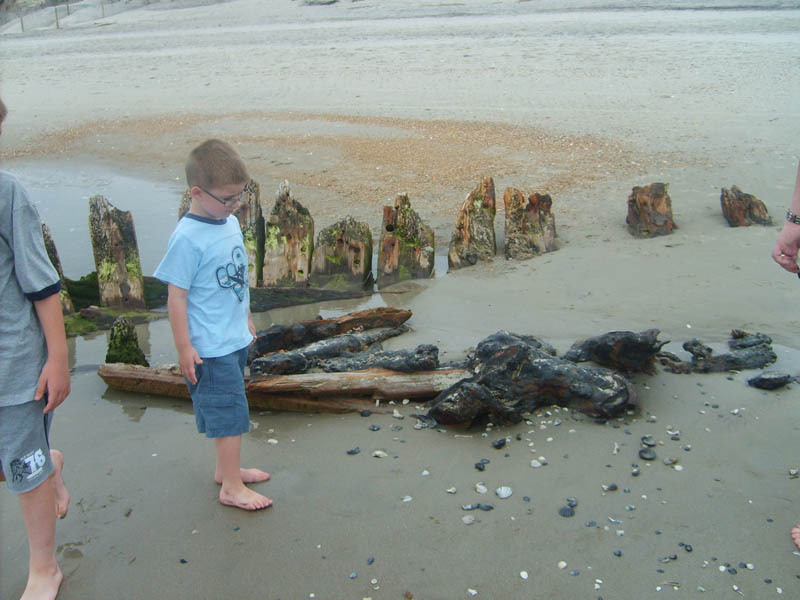 Even the right photo with the person standing near the timbers doesn't do a good job of conveying the actual length of the Wells still hidden beneath the sand. Perhaps on a subsequent trip it will be more visible and better photos can be obtained. 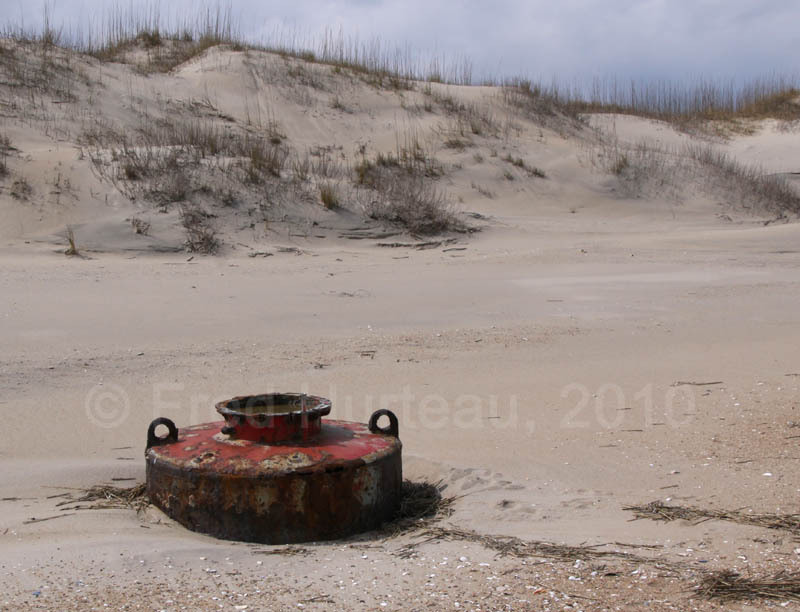 Location: at the base of the dunes about 150 feet north of the Albacore St. beach ramp, Corolla. How To Find It: From Hwy. NC 12 south of Corolla turn east onto Albacore St. which ends in a beach ramp and beach access walkover. Go onto the beach and turn north, approx. 150 feet to the wreckage. 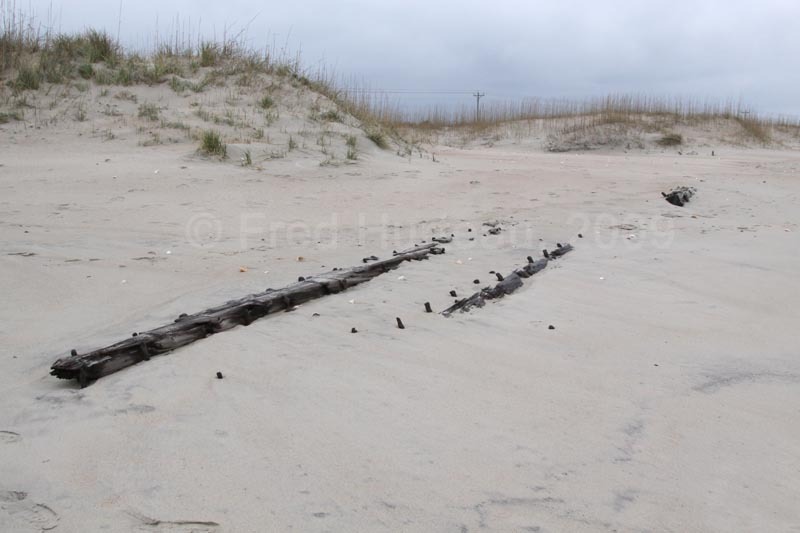 NOTE: This wreck was only visible because storms had severely cut back and eroded the high dunes. 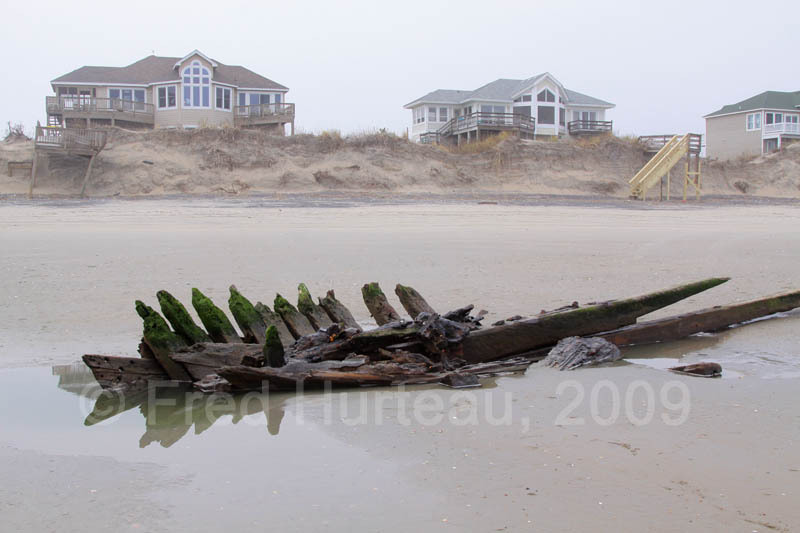 The nor'easter storms of late November and mid December, 2009, exposed a number of wreck sites along the Outer Banks. 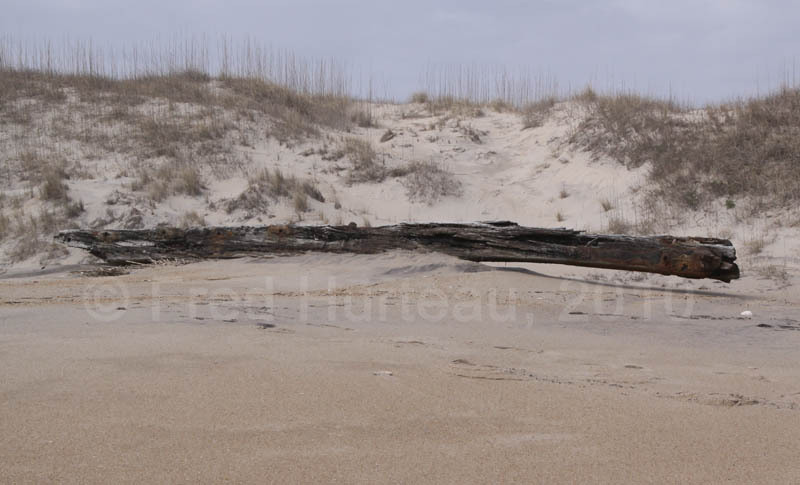 This is one of them, which appeared when the dunes in the Corolla area were severely eroded because of storm wave action. 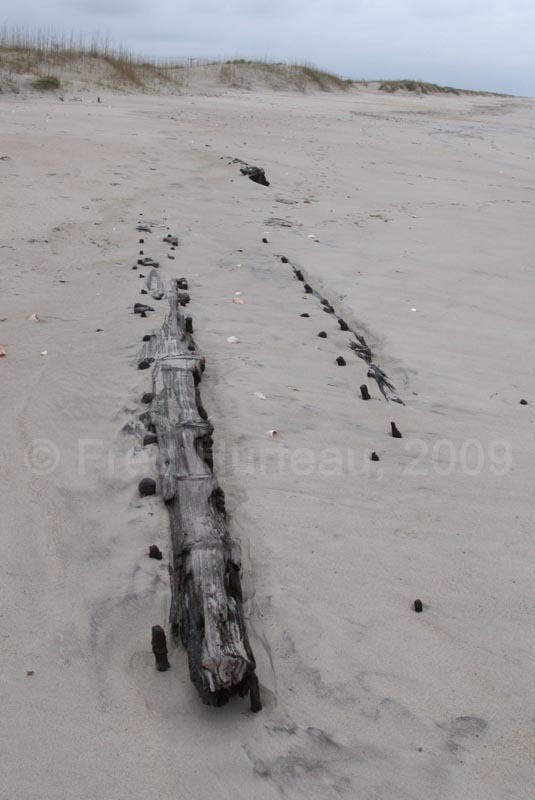 The visible portion of the central beam was over 50 feet long, making this one of the larger wrecks along the Outer Banks. It would hardly take a foot of sand to cover this wreckage, and if the dunes build up again, it will be hidden even deeper once again. Location: behind the first row of dunes approx. 1/2 mile south of Ramp #27, Hatteras Island. How To Find It: Take Ramp #27 onto the beach and go south approx. .5 miles. Walk between and behind dunes to find it. NOTE: This can easily be covered by an inch of sand and be missed completely, since it lies flat. 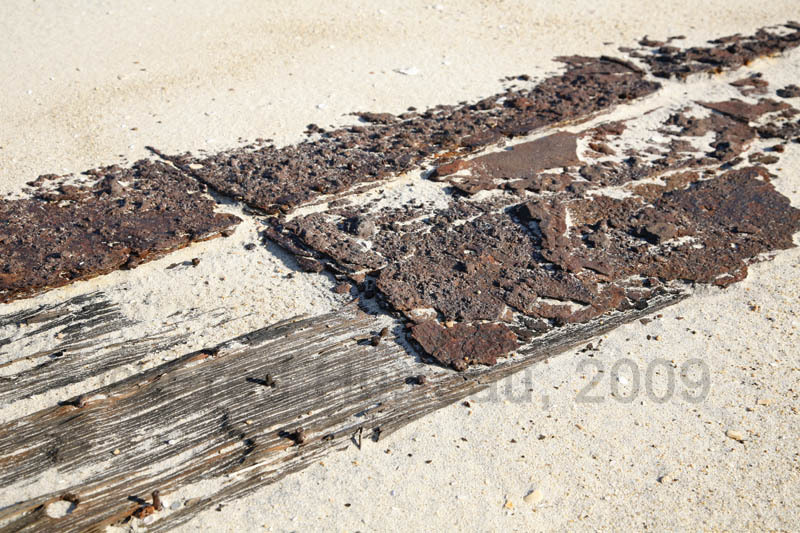 The "Iron Sheathing Wreck" gets its name from the rusted iron plates that cover it, which can be plainly seen in the left photo. Only a few feet of this wreckage was visible on the day these photos were taken, and even that was just barely visible. 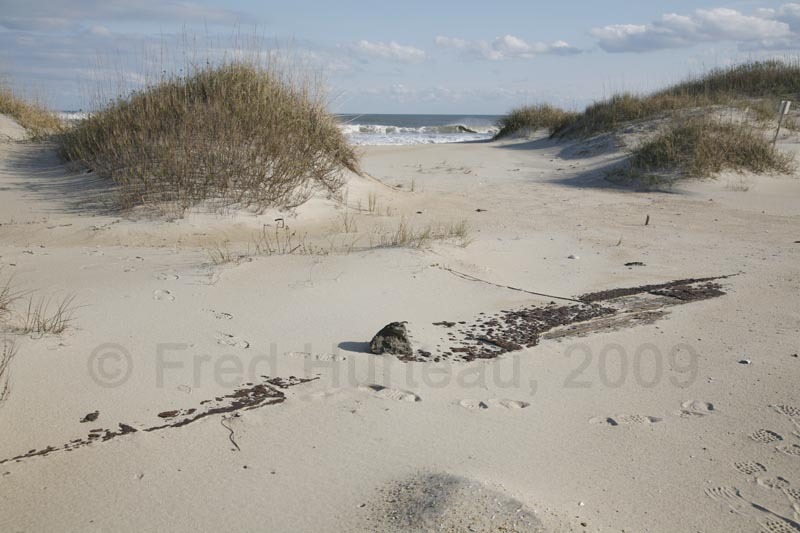 The right photo is looking northwest, and shows how this wreck sits among many low dunes. In this environment it can very easily be covered by blown sand, and in fact, just one inch of additional sand would have completely hidden it from view. When looking for wreckage in this situation it would be good to trust the GPS coordinates and poke at the sand with a thin stick or rod to reveal its location just below the sand in the event it isn't visible. 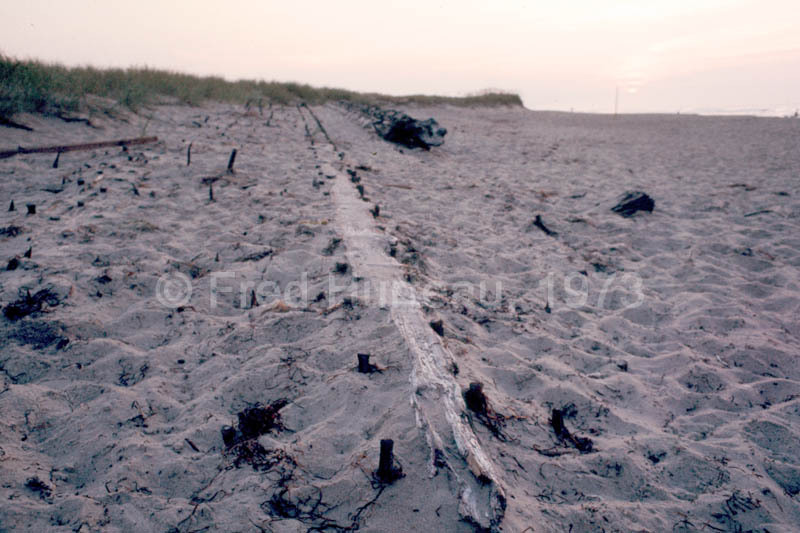 The right photo here shows the relationship of the wreckage to the beach, visible between the dunes in the photo. Without GPS coordinates, it would be very unlikely that wreck sites like this one would be found, although I did in fact locate this based on the "1/2 mile south of Ramp 27" directions alone, but also knowing that I would have to look behind the dunes. In truth I walked right over it (footprints visible in the right photo) before realizing it was the wreck and not just some dark colored flotsam washed behind the dunes. Location: reported to be on the beach about 1.6 miles south of the New Inlet boat ramp on Pea Island. 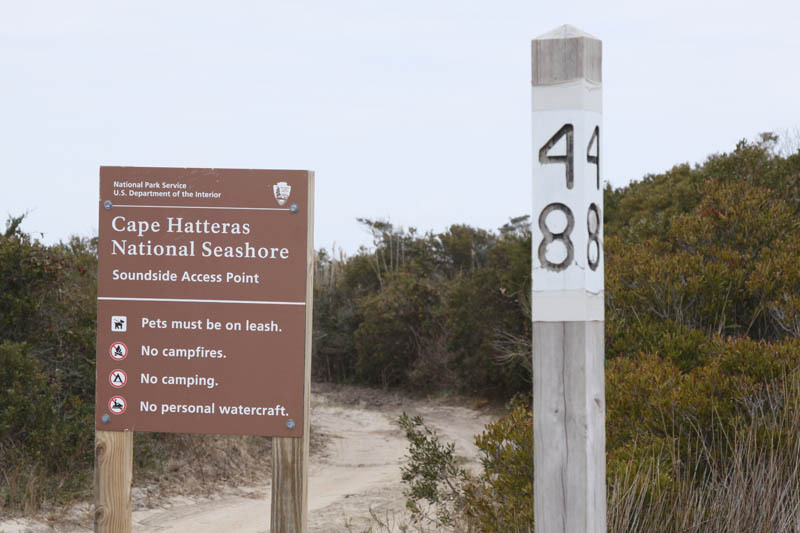 How To Find It: No beach driving access is allowed on Pea Island. From the New Inlet boat ramp access on NC Hwy. 12 (New Inlet is at milemarker 34), go 1.7 miles south and park along the roadside. Here there is a small wooden "bridge" across the ditch on the east side of the road at N 35.65121, W 075.47665. Cross the ditch and look left (north) where there is a path that leads to the beach. Follow the path and you will come over the dunes directly at the reported coordinates (as above) of the E.S. Newman wreckage. I have not yet been able to locate the wreckage or verify the coordinates as reported. My first problem in the search for the E.S. 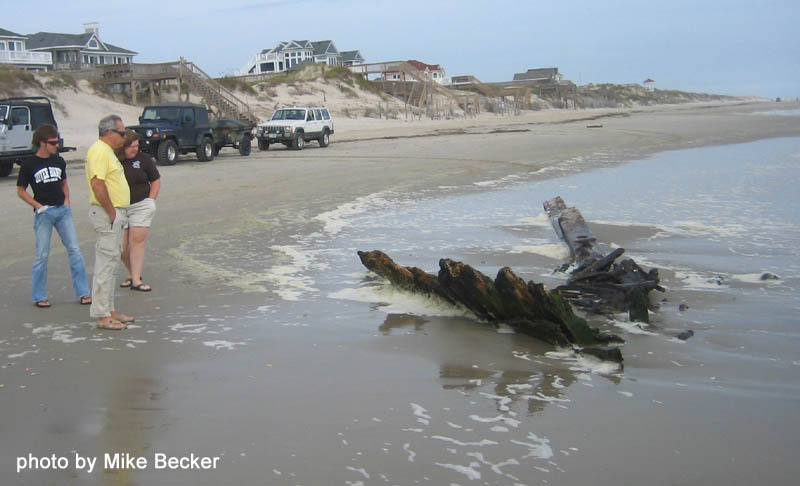 Newman wreckage was to find foot access to the beach near the reported site, since there are no 4x4 beach ramps on Pea Island, and no beach driving is allowed there. Much of the area next to the road is covered in heavy brush, thickets and small pine trees, making it difficult to reach the dunes from the road. In addition. the ditch is often filled with water and wide enough that it is difficult to jump across. I finally stumbled upon a small wooden bridge across the ditch near the E.S. Newman site, adjacent to an area mostly bare of the troublesome thicket found elsewhere. That location is shown in the left photo. From here the beach is relatively easy to reach via an apparently well-used foot path. Upon crossing the ditch, the path is plainly visible off to the left. In fact, when the location was plotted on Google Earth it actually showed the foot path in the aerial photo map on Google Earth. As there is no other reason I can find for this bridge or path to be in this location, it must be tied to the wrecksite. 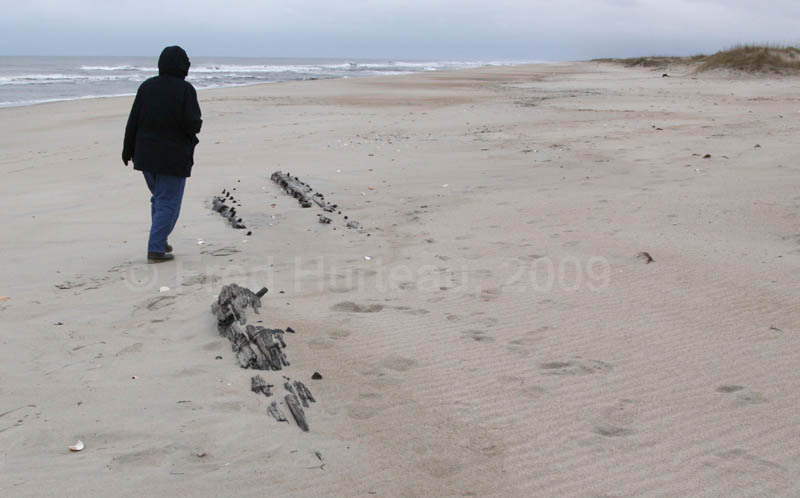 The path comes out onto the beach directly at the reported coordinates of the wreckage. Please note that hiking in this area without boots is ill advised. 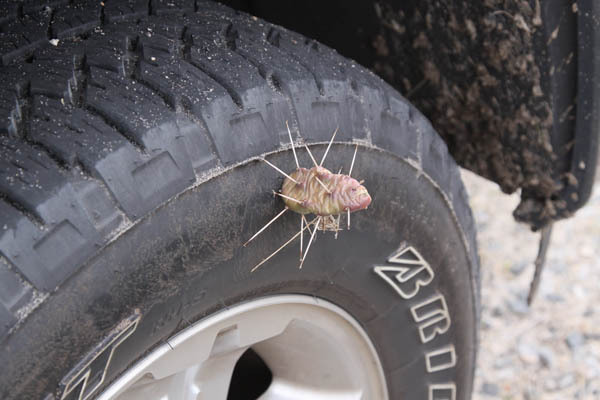 When I returned to my vehicle after my search I had a piece of cactus with a dozen 3-inch spines jammed into the toe of my boot (yes, there is a cactus that is a common plant here). Flip-flops and beach sandals are NOT advised as safe attire when hiking here. I've even had the things attack my truck tires as evidenced by this photo. A subsequent visit to the site during better weather than the first visit allowed me to carefully check the coordinates I was working from. I found out those coordinates would have put me some twenty feet into the surf, even at low tide. It is possible the coordinates are not accurate. It's also possible any wreckage is completely covered with sand higher on the beach. During both my attempts to locate this wreckage I noted that another well-known wreck in the area, the G.A. Kohler, was also completely covered from sight. I know the Kohler comes and goes from sight as the beach builds and washes, so I will plan to revisit these Newman coordinates at a time when the Kohler is once again visible. This and all other wreck locations on CarolinaOuterBanks.com can be obtained already plotted for you on Google Earth simply by downloading my "KMZ" file. If you have Google Earth installed on your computer (free download from Google Earth at http://earth.google.com) then downloading this file will automatically offer to open Google Earth and show you these shipwreck locations. How To Find It: Follow the directions to reach either the E.S. Newman above, or the M.A. Spencer below. Located about half way between the two, and within sight of their reported coordinates. 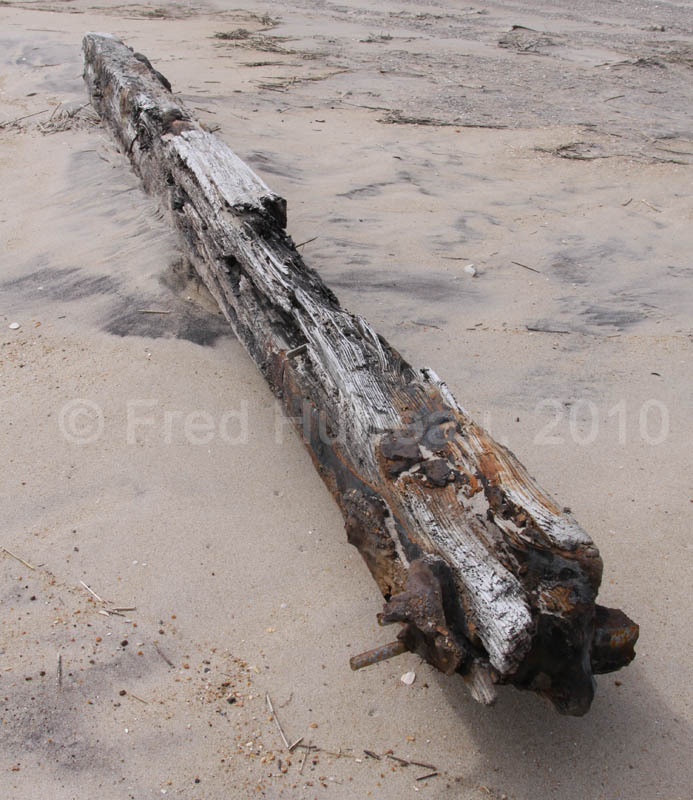 This single beam was found while searching for the Newman and the Spencer, and is approximately half way between the reported locations of those two wreck sites. It sat just at the high tide line, likely having been deposited there by the surf. As such, it will very likely be moved easily by the next tide high enough to float it again, and is not expected to remain where it is. Could it be a piece from either of those two wreckages? It's a possibility, but no more likely than to be from some other wreck along this coast. 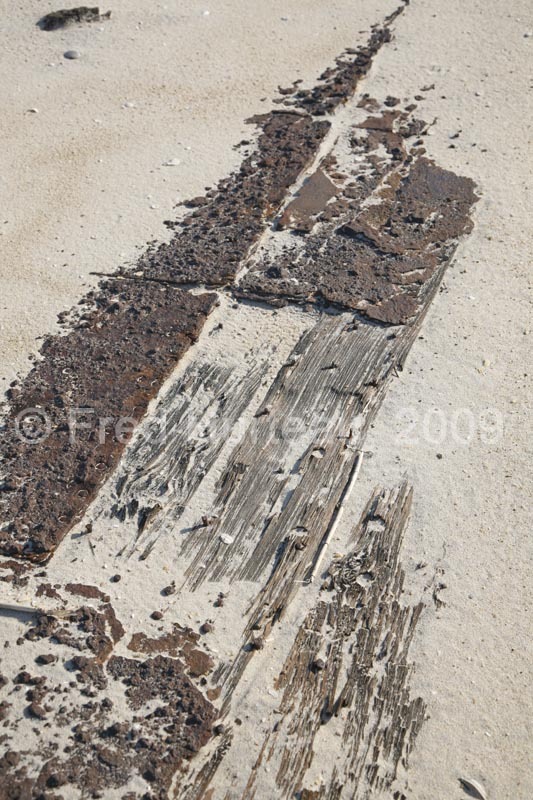 It is surely a piece of wreckage because the tell-tale pitch deposits and spikes were present as shown in the top right close-up. It measured approximately 22 feet long. 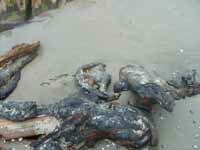 Location: reported to be on the beach about 2 miles south of the New Inlet boat ramp on Pea Island. 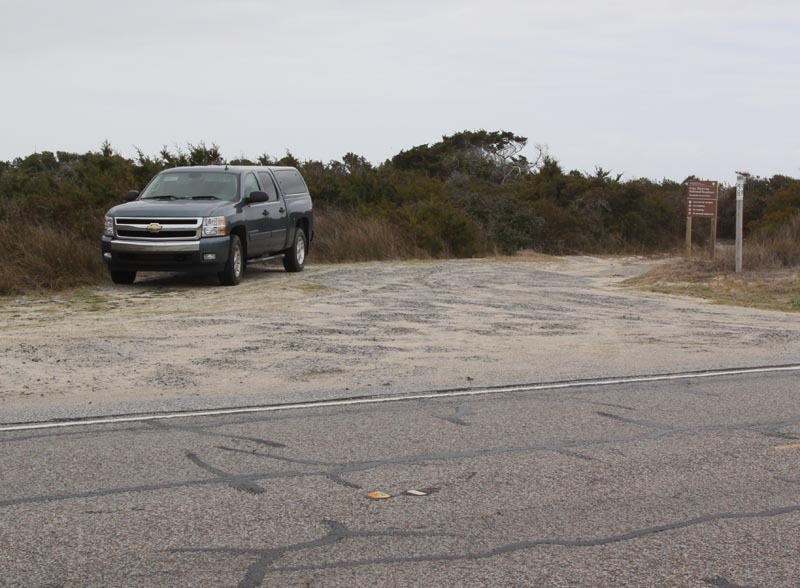 How To Find It: No beach driving access is allowed on Pea Island. Park along NC Hwy. 12 at 2 miles south of the New Inlet boat ramp access. Look for an area of minimal vegetation where you can cross the ditch on the east side of the road and walk east toward the beach. You should come over the dunes very close to the reported area of the wreckage. Crossing a water-filled ditch may be difficult without bringing along a thick wide plank 3-5 feet long to use as a temporary "bridge". Alternately, use the existing "bridge" noted in the previous entry above that leads to the reported location of the E.S. Newman, then walk along the beach approx. 3/10 mile south to the reported coordinates. I have not located the M.A. Spencer at the coordinates reported above. 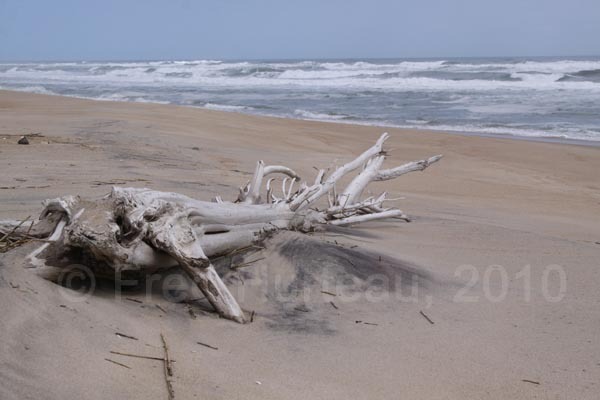 The reported coordinates fall between the driftwood and the surf line in this photo at right. 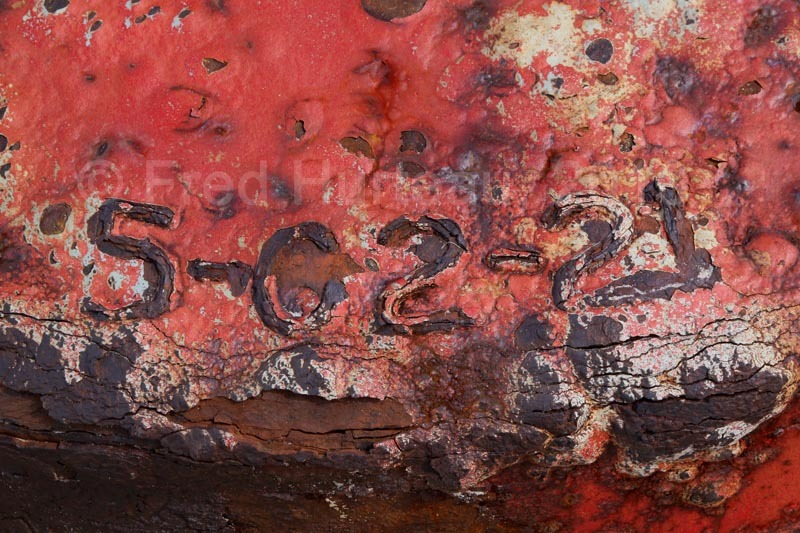 It is possible the coordinates are inaccurate and the wreck is covered higher on the beach. I will continue to check this location. 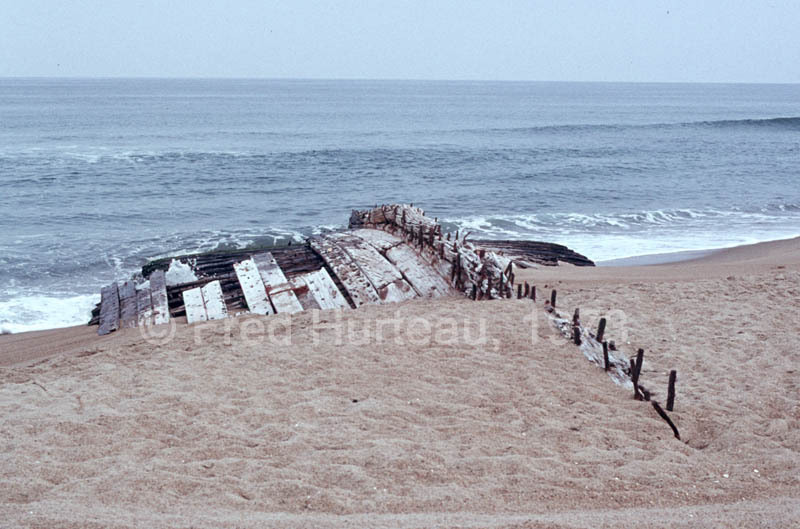 Below are some photos I took of the wreckage as it existed in 1973. Perhaps some day soon I will find it uncovered again. How To Find It: Go 2 miles south of the New Inlet boat ramp access and watch for a wooden plank "bridge" across the ditch (further details below). Cross ditch and follow well-marked path to beach, then turn south. A second well-marked "bridge" across the ditch was found at GPS coordinates N 35.64455, W 075.47482 while searching for a cross-over near the reported location of the M.A. Spencer. This bridge accesses a well-used path marked every 30 feet or so by wooden stakes with red reflective tape. Very likely this was installed by the Park Service, as the path comes out onto the beach next to a marked protected area, possibly a bird nesting site. Turning north will take you to the reported coordinates of the M.A. Spencer. 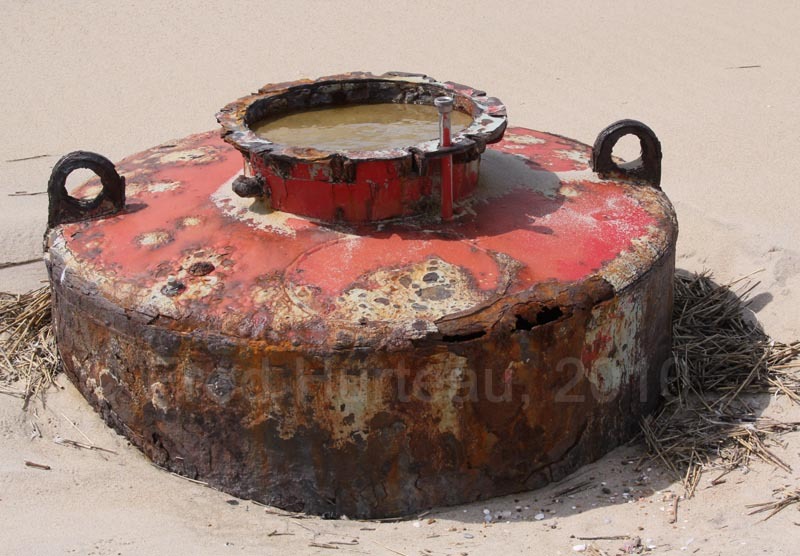 However, going some 50 - 100 feet south will take you to the large red metal "tank" shown in these photos. 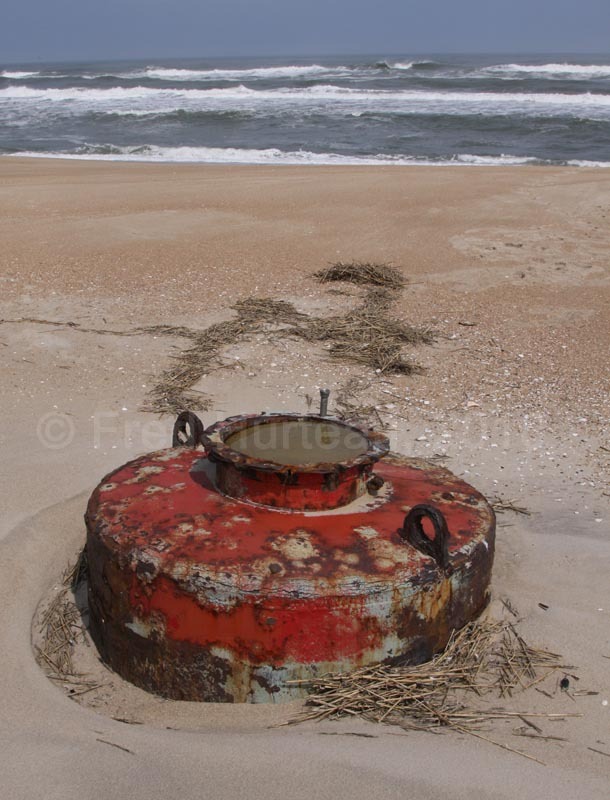 Best guess is that this is the floatation base for an old sea bouy. It is marked with the identification "5-C2-21". While this isn't the usual wooden wreckage, it is an interesting and colorful sight on the beach, and was found as a result of looking for another access to reach the sight where the Margaret A. Spencer is reported to be. 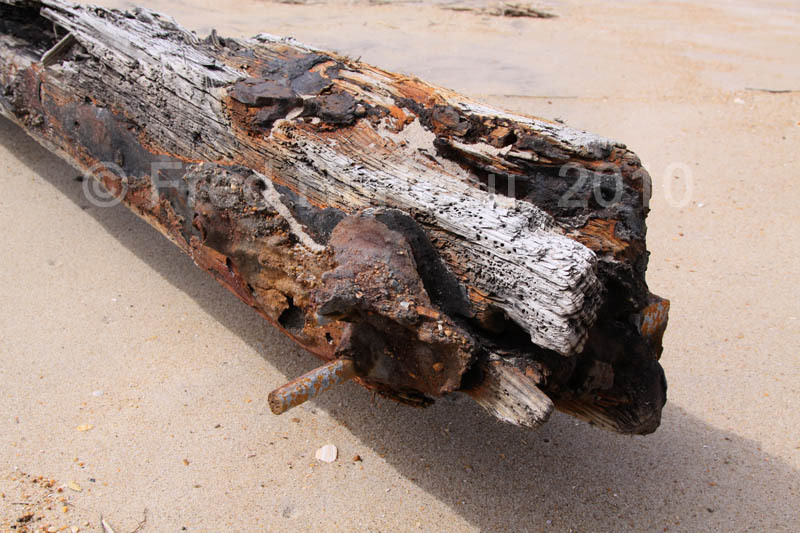 Location: reported to be on the beach about 8/10 mile south of Ramp #27, which puts it just 3/10 mile south of the Iron Sheathing Weck on Hatteras Island. How To Find It: From NC Hwy.12 south of Salvo take Ramp #27 onto the beach and go south 8/10 mile. Alternately, stay on Hwy. 12 and go 8/10 mile south of Ramp #27 to the Soundside access #48 drive entrance. There is space to park here beside the drive safely off the road. Cross the road, jump the ditch in a clear spot and walk about 200 feet to the beach. The photos at right show the place to park so you can walk to the beach from Hwy. 12. 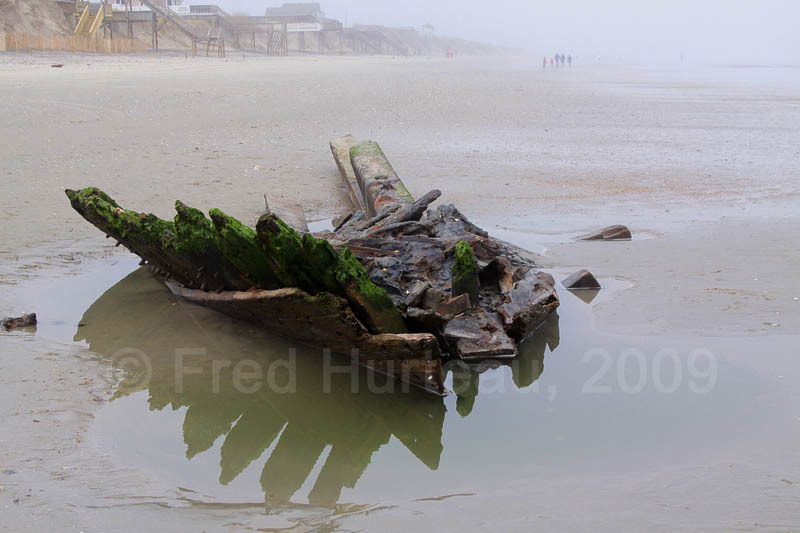 Though I have found how to most easily reach the beach where the wreckage is suppose to be, I have yet to locate the uncovered wreckage of the Priscilla. The search will continue. 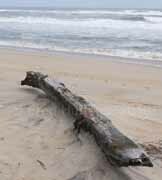 Location: reported to be on the beach about 1.2 miles north of Ramp #34 or 3 miles south of Ramp #30 on Hatteras Island. How To Find It: From NC Hwy.12 south of Salvo (and north of Avon) take Ramp #34 onto the beach and go north 1.2 miles. Alternately you may take Ramp #30 and go south for 3 miles. There is also a deer crossing along the highway adjacent to the reported wreck location at a spot relatively clear of undergrowth located at N 35.394770, W 075.491670. I have not located the uncovered wreckage of the Robert W. Dasey. Since this wreckage is so far from both Ramp #30 and Ramp #34, I searched for foot access from highway NC 12 in hopes it might be easier. I came across an area almost due west of the wreck location where the usual heavy thicket had an opening that looked passable and found there was a handy dandy deer crossing of the ditch right at that very spot. Though the ditch was filled with water, it was barely narrow enough that I could jump across (with some difficulty) and reach the beach, though even here the beach is a stroll of 2/10 mile from the road. Bringing along a couple of wide, thick 3-foot to 5-foot long planks to use for crossing the ditch would be very helpful in these situations. 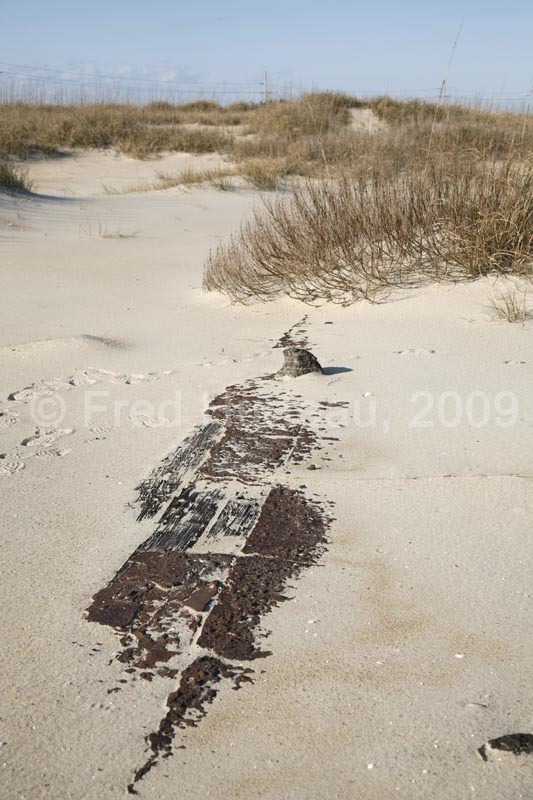 The deer crossing is located at GPS coordinates N 35.394770, W 075.491670 , which puts it the same distances from the beach ramps as the wreck site itself (as noted above in the "How To FInd It" section). Incidently, while hiking across to the dunes I spotted deer tracks, and spooked a deer grazing among the pine trees. I took a second trip to the site by way of the deer crossing. With better weather this time I was able to verify the coordinates reported for the Dasey actually fall twenty feet into the surf, even near low tide time. The coordinates may be wrong, the beach may have changed or the wreckage could be covered with sand farther up on the beach. Like the Newman, the Spencer and the Priscilla, all of which are along the same stretch of beach, these may become visible at a time when the Kohler is again uncovered.